The sixth “Mission: Impossible” film, “Fallout,” written and directed by Christopher McQuarrie, plays out like a Greatest Hits collection, making numerous references from previous entries, particularly serving as a direct sequel to “Rogue Nation” in terms of plot and recurring characters. And yet it never comes across as a lazy, last-minute compilation. On the contrary, it strives to entertain the audience by making sure that nearly every element looks bigger and increasingly more impressive as it goes on, especially its jaw-dropping action sequences and practical stunts. I was impressed with its willingness to put the viewers in the middle of the action and provide a specific experience filled with sudden left turns. We know they’re coming—because that is the nature of the franchise—but we’re surprised anyway. Although the plot is as generic as it comes—a potential weapon of mass destruction is lost to those who wish to use it and the item must be acquired before millions are killed—there is a freshness laid on top of it because the characters who are pushed by the plot are played by performers who are veterans in exuding a certain effortless cool, from familiar faces like Tom Cruise as the moral government agent/main protagonist Ethan Hunt and Simon Pegg as the bumbling but charming tech guy to new additions like Henry Cavill as a formidable assassin assigned to ensure that Hunt follows protocol for once and Angela Bassett as the CIA director who wishes to keep Hunt on a very short leash. These actors sell their roles with convincing authority, colored by a balance of tension and humor that is perfect for summer blockbusters. I could watch these characters simply sitting in a room and conversing. Intense and knowing pauses are required. Action films are no stranger in showcasing international destinations. Usually, the rule is the more locations are visited, the grander the story being told. However, only a handful, the true standouts, strive to utilize exotic locales as characters in and of themselves. Notice how the first three “Bourne” films manage to stand the test of time. In this picture, for example, Paris is used so thoroughly that its labyrinthine streets and alleyways command personality… and sometimes the personality is dependent upon the district. Narrow walls and cars passing by within speed limit are as dangerous as flying bullets. In other words, its action sequences are never boring exactly because there is more than one way to cripple an enemy. The violence is not reliant upon throwing punches or using guns or assault weapons. But when it does go back to basics and employ hand-to-hand combat, it remains thrilling. There is a wonderful ballet of kicks and punches early in the picture that involves Hunt and Walker (Cavill) having to face a highly trained assassin (Liang Yang) in the bathroom of the Grand Palais. The goal is to knock the man unconscious so they can make a scan of his face and create a mask… but the men glued by a tenuous partnership get more than they bargained for. Our expectations are played with because we assume Hunt and Walker to have the advantage since it is the first time they are on assignment together. Surely the scene is setting them up to be a surprisingly effective duo. The screenplay’s willingness to forge one step ahead of the audience is perhaps its greatest asset. It is quite a feat for an action picture to run for one hundred fifty minutes and not for a minute does it wear out its welcome. 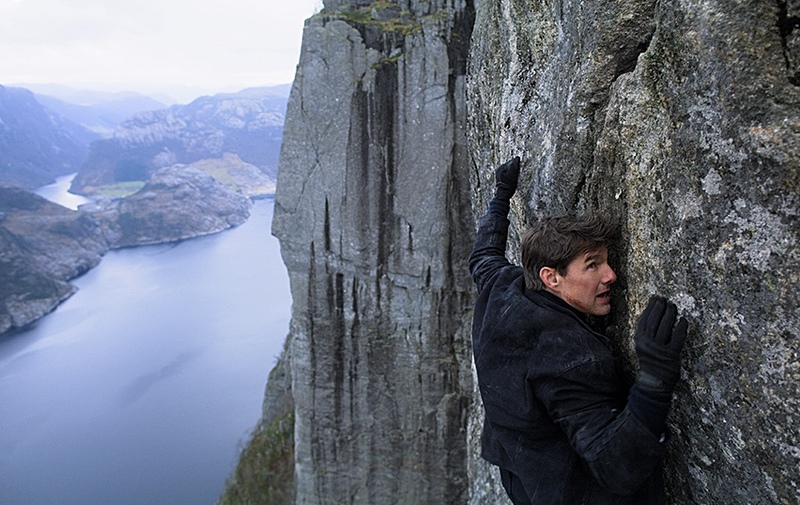 Whether the action is unfolding in the busy streets of Paris under broad daylight, within the darkness of claustrophobic warehouses, in the grubby sewers, or hundreds of feet up in the air, “Mission: Impossible – Fallout” maintains its high energy, visual acrobatics, and tension-filled encounters. It is a popcorn movie of the highest caliber.